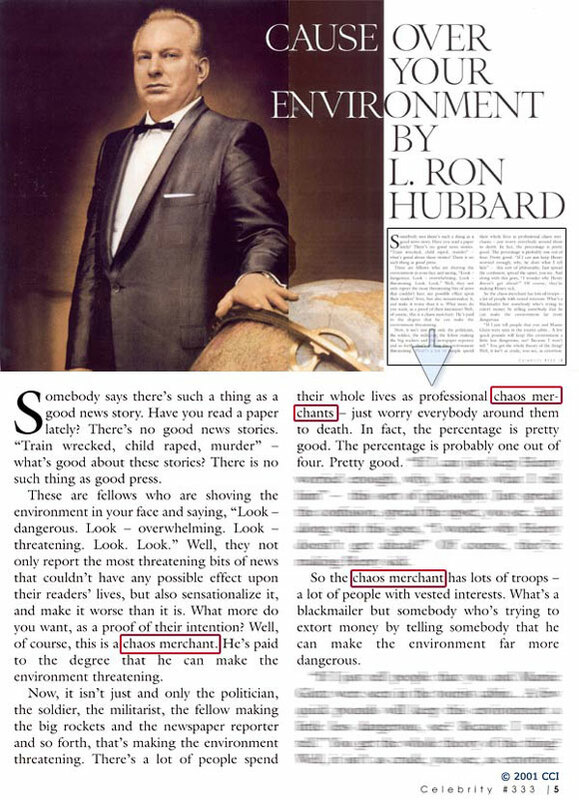 This magazine article is an excerpt from Hubbard’s lecture Scientology Zero [pdf]. 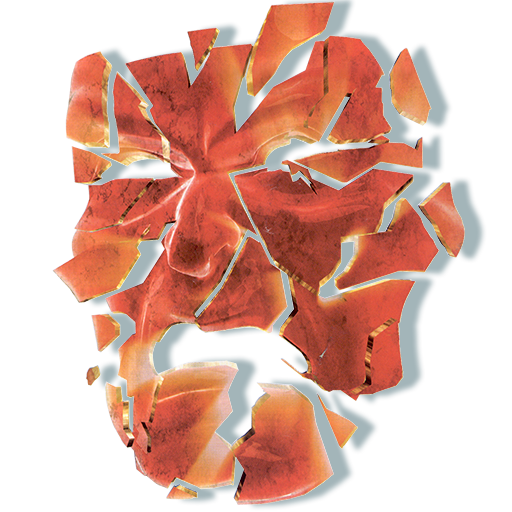 When we examine this extremely accurate and very brief account we see that there must be amongst us some very disturbing elements for anything else to be believed about Scientology. It is to their interest to make the environment seem as threatening as possible for only then can they profit. Their incomes, force and power rise in direct ratio to the amount of threat they can inject into the surroundings of the people. With that threat they can extort revenue, appropriations, heightened circulations and recompense without question. These are the merchants of chaos. If they did not generate it and buy and sell it, they would, they suppose, be poor. For instance, we speak loosely of “good press.” Is there any such thing today? Look over a newspaper. Is there anything good on the front page? Rather there is murder and sudden death, disagreement and catastrophe. And even that, bad as it is, is sensationalized to make it seem worse. This is the coldblooded manufacture of “a dangerous environment.” People do not need this news and if they did they need the facts, not the upset. But if you hit a person hard enough he can be made to give up money. That’s the basic formula of extortion. That’s the way papers are sold. The impact makes them stick. A paper has to have chaos and confusion. A “news story” has to have “conflict” they say. So there is no good press. There is only bad press about everything. To yearn for “good press” is foolhardy in a society where the merchants of chaos reign. The chaos merchant has to inject one of several possible conflicts here: He is not a doctor of philosophy, they have to assert. They are never quite bold enough to say it is not a philosophy. But they can and do go on endlessly as their purpose compels them, in an effort to invalidate the identity of the person developing it. newsworthy. 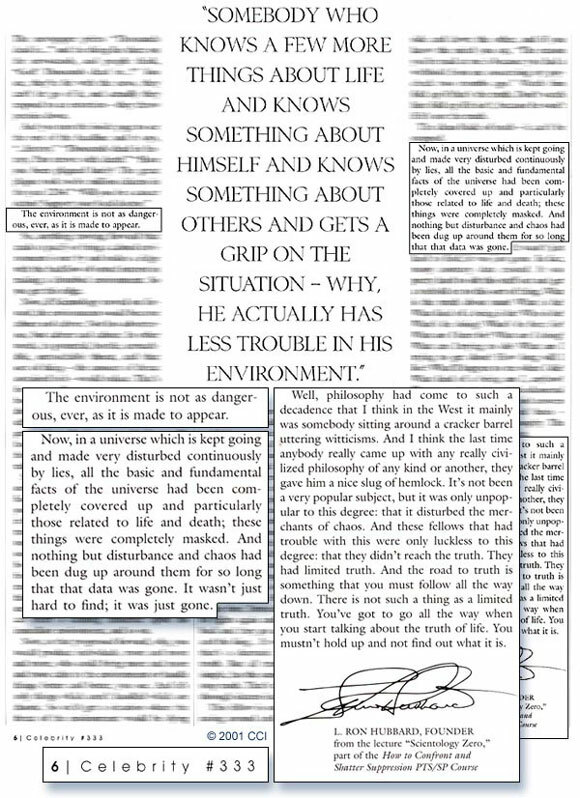 To write the simple fact that a doctor of philosophy had developed a philosophy is not newspaper-type news and it would not disturb the environment. Hence the elaborate news fictions about (1) above. However, to make this “news” it has to be made disturbing. People are painted as kidnapped or hypnotized and dragged as unwilling victims up to read the books or listen. The chaos merchant leaves (3) very thoroughly alone. It is dangerous ground for him. “People find it works.” No hint of workability would ever be attached to Scientology by the press, although there is no doubt in the press mind that it does work. That’s why it’s dangerous. It calms the environment. So any time spent trying to convince press Scientology works is time spent upsetting a reporter. On “(4) People pass it along to others,” press feels betrayed. Nobody should believe anything they don’t read in the papers. How dare word-of-mouth exist? So to try to stop people from listening the chaos merchant has to use words like “cult.” That’s a closed group. And they have to attack organizations and their people to try to keep people out of Scientology. Now as for “(5) It grows,” we have the true objection. And their threat is the simple story of Scientology. For that is the true story. And behind its progress there is a calmer environment in which a man can live and feel better. If you don’t believe it, just stop reading newspapers for 2 weeks and see if you feel better. Suppose you had all such disturbances handled?